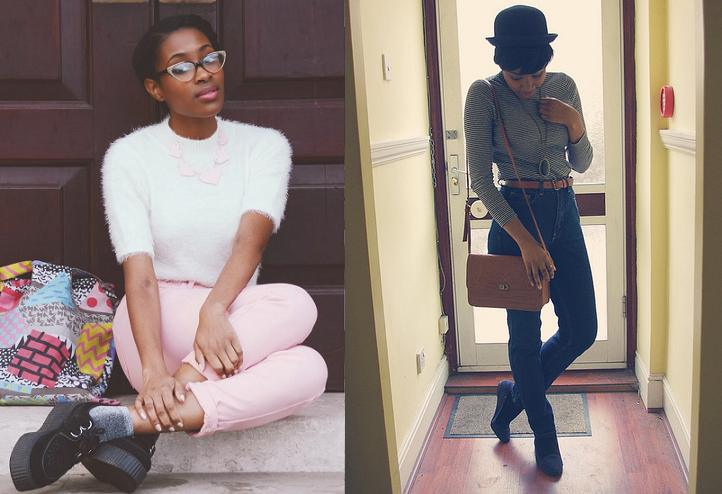 Yet again, I'm super duper behind with my 'Favourite bloggers of the month' post! 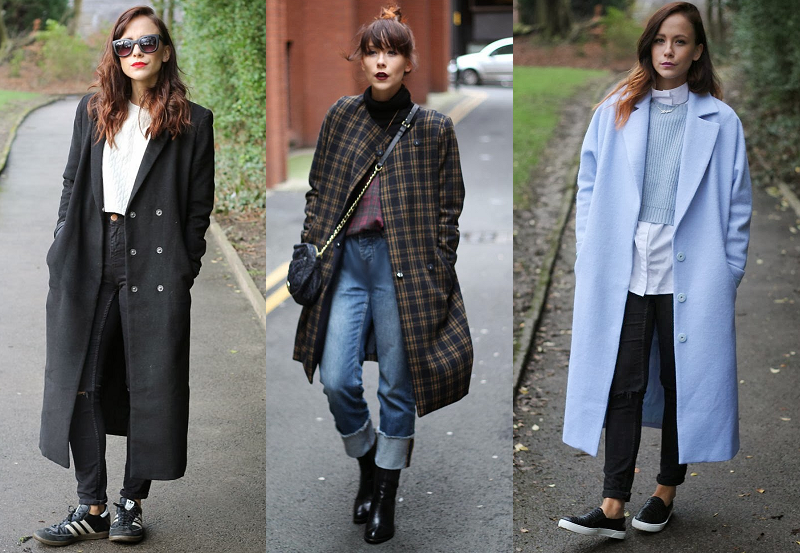 It's turning into more of a faves of the season post, and for this I apologise! I'm literally swimming in third year uni work, and I will be until I finish in May, but I promise that once I'm all done for good, blog posts will be regular, hopefully even daily, which should be fun! 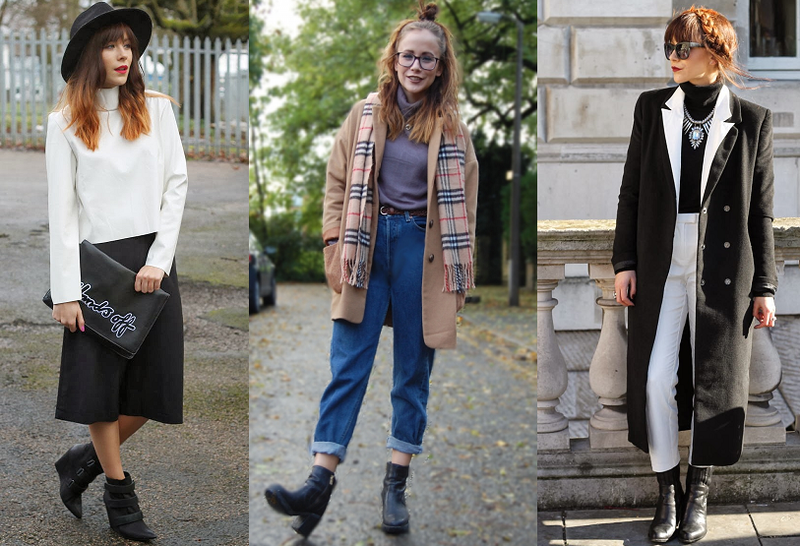 :) I do love doing these blog posts though, it's lovely to be able to show you some of my favourite bloggers who influence me, and it's also nice to go back through their blog and find some of my all time favourite outfits of theirs! 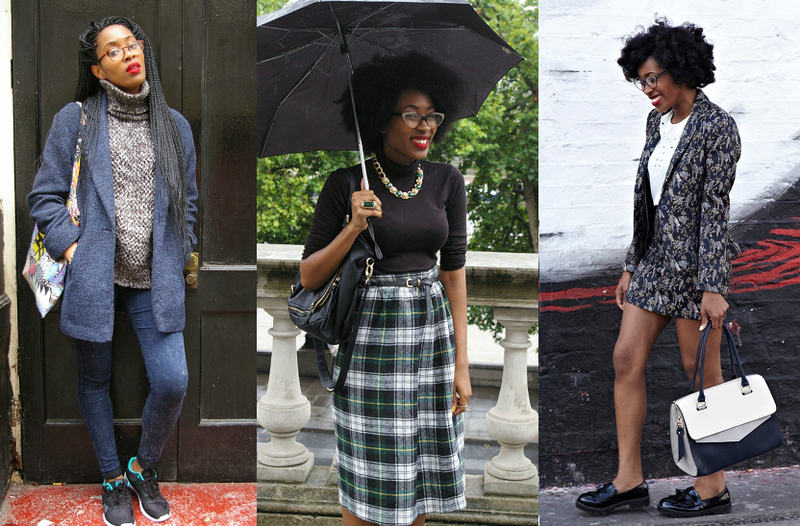 My first favourite blogger of this month is the gorgeous Sade from In My Sunday Best. I've been a fan of Sade's blog for what seems like years now, way back when she had a little pixie crop! She literally suits every single hairstyle I've seen her have too, jealous. She has so many lovely clothes, and I love the way she mixes vintage and modern finds together (including loads of cute shirts and charity shop bargains!) I love how cute she is in her natural smiling photographs too! Introduce yourself and your blog? My blog name comes from Ebony Bones "The Muzik" lyrics! "Sitting on doorsteps... In my Sunday best" - I love that song and it just fits perfectly. Where are your favourite places to shop for clothes and accessories? Everywhere and anywhere that fits my student budget to be honest but I'm partial to a good bit of vintage, ASOS, Warehouse and Zara! Do you have a favourite style icon? So many! From Dorothy Dandrige, to Audrey Hepburn, sometimes it's patterns or colours even feelings that inspire how I dress. Which song/songs do you have on repeat recently? I've been listening to "Rather Be" by Clean Bandit on repeat lately. Which item of clothing can you not stop wearing recently? I've been wearing my new Camel coat from Warehouse obsessively lately. I just love the colour and how well it goes with everything, plus it's a boyfriend fit which makes it even better! 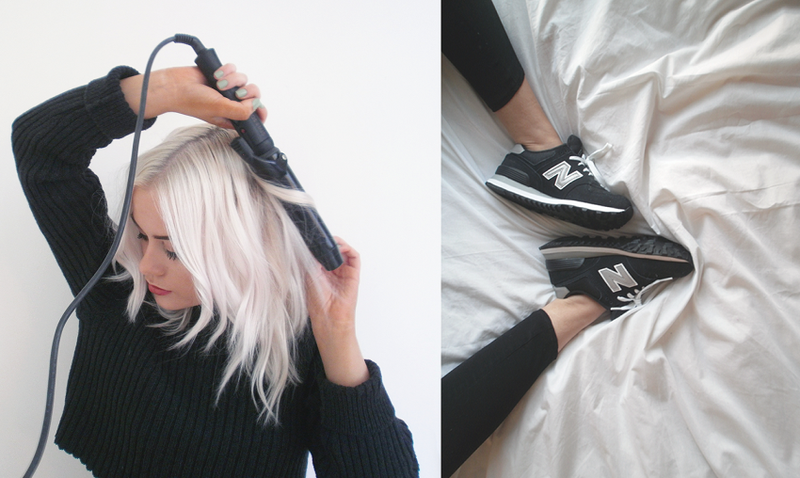 My second favourite blogger from this month is the babe that is Charlotte from IAmCharlotteMartin. I am obsessed with her simplistic, monochromatic wardrobe with an odd splash of colour. She posts her OOTDs, hair tutorials, fashion posts and more. She has lovely bleach blonde hair and legs to literally die for. My name is Charlotte Martin, I'm 21 years old and I'm from Newcastle Upon Tyne but currently finishing up my last year studying in Nottingham. I started my blog quite simply as a way to record different outfits, inspiration etc I was already using platforms like Tumblr and Polyvore and it seemed like a natural progression to record what I'd actually worn. 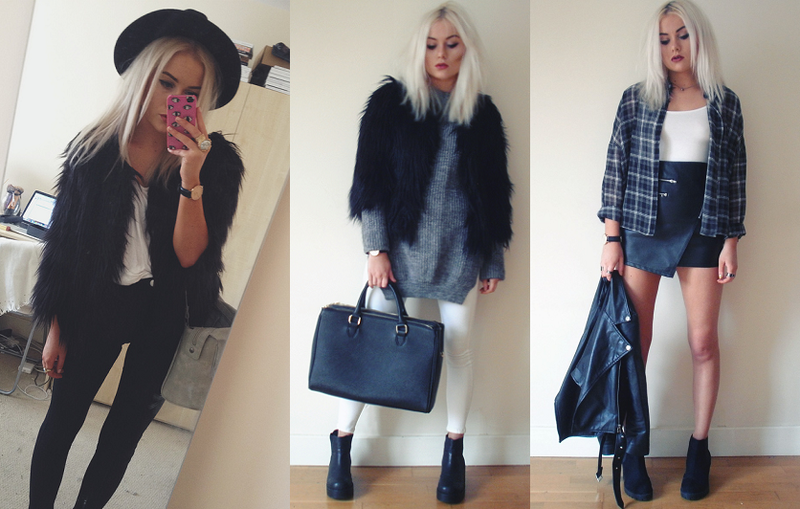 My blog name 'iamcharlottemartin' is pretty much self explanatory. The Charlotte Martin domain was already taken so I just went with the next best thing. I have a certain air of smugness when I hear people saying how much they hate their blog names. My favourite places to shop for in terms of budget are Monki and H&M but I also do a lot of searching online using eBay. I wouldn't say I have one particular style icon but Debbie Harry is a dream. Anything by Interpol is on repeat (especially PDA) at the moment as well as Age of Consent by New Order and the Jacques Green remix of Body Party by Ciara. I never stop wearing leather jacket and my leather jacket of choice at the moment is a slightly cropped, boxy piece from Missguided. Iyaaaaaaa, I'm Megan and I write fashion blog www.whatsnewpussycatt.blogspot.co.uk, I'm 21 and from Manchester. My blog is approaching it's first birthday hurray, I initially started my blog as a little online diary to keep track of my adventures as a fashion uni student, whilst on my placement year from uni. It is just kind of took off from there, where I, as cheesy as it sounds, pretty much fell in love with blogging and the whole little community that comes with it! I have no idea why I chose the name of my blog, to be completely I honest I don't like it anymore! I'd love to change it! My favourite shops are Topshop & Zara, hands down! However, for me though ASOS is my one stop shop for clothing, they do no wrong in my eyes! Alexa Chung has been my style icon since I was about 14 years old, I remember first getting my hair cut like hers and feeling super cool! Now I only take aspects of her style into mine, and I have deffo found my own personal style. But I think its great to be influenced! I also love Laura Jackson, she is deffo on Alexa's tail in the style stakes! My favourite singer at the minute is Keaton Henson, he has the most beautiful voice, if not a little haunting and heart breaking! It's the perfect album to chill out to! A statement coat is my piece of the season, I have acquired way too many; I'm worried my door is going to fall off it's hinges under the strain of them all! I hope you've found some lovely new blogs to follow! Did you already follow all these girlies? I always love discovering new bloggers, I'll have to check these ladies out!